Our first step is to make a plan. Doing some research ahead of time really expedites the process. Take a little time to plan out colors, themes, and artistic ideas. We can also help you out with many possibilities. Look at our galleries to help you start off in the right direction. Your decisions will be permanent, so really think it out carefully. 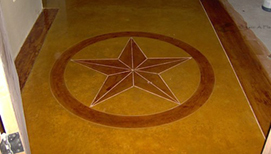 Think of your floors as a blank canvas…and you get to be Picasso. TESTING: Every concrete surface is different from another. Differences of temperature, mix and water content always make a difference. That’s why it’s crucial for us to test its suitability in accepting stain before we begin a job. SURFACE PREPARATION: The cleaning method depends on how soiled the surface is. At the minimum, the surface will be cleaned with soap and water. In remodels, you generally have a considerable amount of preparation work. You may have numerous contaminants on the floor. We will try our best to remove most if not all contaminants such as coatings, paints, waxes, water repellents, previously applied adhesives with a mechanical floor machine. PATCHING & CRACK REPAIR: Patches may accept stain differently from the rest of the floor. In this case, we may have to incorporate this difference into your floor design. The most effective way to apply chemical stain to a large area is by spraying and scrubbing the stain in. Stains can be applied by with sponge and bristle brushes and rags. If the floor has been scored to achieve a “Tile-Look,” then the stain can be applied in different colors for the different tiles. Multiple stains can be added upon drying to achieve the desired effect. Finishing, sealing and maintenance are important parts of achieving a durable, chemically stained floor. 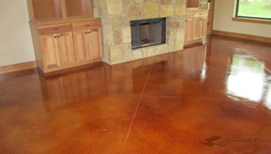 We will coat all chemically stained concrete floors with a sealer and wax to protect them. Most floors with saw cuts and stains look better with unsanded grouted saw cuts. How much traffic the surface receives often dictates the amount of ongoing maintenance required. To protect your investment. For interior concrete floors subject to only light foot traffic, maintenance is usually a simple matter of dry dust mopping and occasional wet mopping with a neutral-pH cleaner. If stained floors begin to loose their luster or shine, rewaxing will usually revive the appearance. In a typical residential setting, a year or longer may go by before it's necessary to buff and rewax the floor. In businesses with more traffic, it will be necessary to reapply the finish at more frequent intervals. For exterior stained concrete, keep the surface clean by sweeping it with a broom or leaf blower or rinsing with a garden hose. To remove stubborn dirt, scrub with a mop or medium-bristle brush and a mild cleaner. 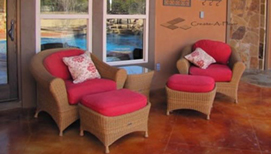 To keep exterior surfaces protected, apply a new coat of sealer every year or two, or as necessary. When you begin to notice that water no longer beads up on the surface, it's time to reseal.